There is much each of us can do to lower our carbon footprint. The following gives some ideas on where to focus and some optimistic news about how much we can all do! By far, the best way to personally make tangible steps to reducing your carbon footprint is to reduce the carbon content of regular expenses. 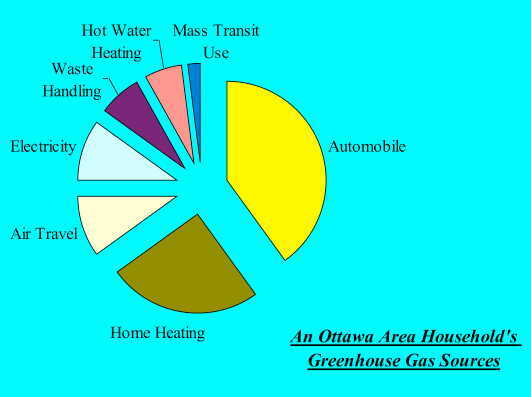 The following pie chart shows where GHG emissions occur for a “typical” local household, and the subsequent discussion details how you can substantially reduce them. This is the biggie! Use of automobiles is about 40% of a typical household’s emissions. The best solution here is a variety of strategies that reduce car use and impact. The list is long and includes things like walking, cycling, and telecommuting, use of mass transit, car pooling, better trip planning, slower driving speeds, tune-ups and tire inflation. For a home heated with natural gas, this is likely a quarter of your GHG emissions (significantly more if you heat with oil or propane, significantly less if you heat with electricity). Green (non-fossil) natural gas will eliminate this as a source. Bullfrog Power http://www.bullfrogpower.com/products/naturalgas.cfm markets green natural gas. Landfill gas is captured for use as a fuel. If you heat with oil or propane, the best current alternative is to buy offsets similar to those outlined above for an automobile. If electricity is your source of heating, see the electricity section below. Air travel is awful for the climate, and the best option is to work hard to avoid it. In addition to releasing lots of CO2, aircraft deposit water vapour in the stratosphere that stops radiation of heat from the planet at night and reduces the daytime output of important terrestrial systems such as growth of crop plants and solar panel power production. Teleconferencing or using other modes of transportation are better options here. Electricity, (including Air Conditioning and maybe heating). The best solution here is to buy green electricity. Bullfrog Power http://www.bullfrogpower.com/products/electricity.cfm markets electricity that is produced from wind and low impact hydro electric plants. The good news is that we all have been dealing with waste for a long time with initiatives like recycling and composting. Keep up the good work and remember to re-gift and donate what you no longer want. $60-$100 should offset the annual emissions from one passenger car or light truck. There are many organizations offering carbon offsets such as Terrapass (http://www.terrapass.com/), Green Power Action http://www.greenpoweraction.com/gpahome.aspx and Offsetters http://www.offsetters.ca/ just to name a few a few. Most funds will allow you to choose the offset project that you want to support. Offset projects that directly eliminate fossil fuel consumption are a good choice as they take more away from the industry that often tells us not to worry about human induced climate change. But beware, not all offset schemes are effective and some are counter productive. When its time to make a big purchase, there is lots you can do to get set up to make a low carbon footprint easy. Here’s a list of some of the main opportunities. Car. If you must buy a car, buy one with good mileage. Plug-in hybrids or non-plug-in hybrids are good if you don’t drive long distances and or mostly drive in the city. Good and simple high mileage cars are another option. HVAC Change-over. If you’re in the market for a new furnace, a heat pump is the best option for reducing green house gases, particularly if you live in Quebec or buy green electricity. In most cases you’ll be in the market for an air to air heat pump (on average it will give you 3 ½ units of heat energy for every one unit of electrical energy consumed). If you have the space and funds to do it, a ground source heat pump is the best technology. The most efficient ground source heat pumps use one unit of electrical energy for each 5 ½ units of heat energy transferred into a living space. Central Air Conditioner. If you’re installing or replacing a central air conditioner, opt for a heat pump as opposed to a simple A/C unit. An air to air heat pump will typically use one unit of electrical energy for every 3 ½ units of heat energy transferred into a living space. Heat pump technology is continuously improving, unlike natural gas combustion technology which has reached a plateau. When natural gas prices resume their rise, heat pumps will become the winners in terms of total cost of ownership. Buying a House. Depressingly, most of the improvements in the energy efficiency of homes since 1990 have been effectively eliminated by people deciding to live in more square footage. So the best decision you can make if you’re buying a place to live is to not be a glutton for square feet. Once you move into your new place, consider an energy audit from a qualified auditor to help make a plan to have it use less energy. The Envirocentre (http://envirocentre.ca/) has qualified household energy auditors. Some of these purchase decisions will last beyond the time of you owning the things listed (such as a house or solar panels) but will pass on to future owners – a great added benefit! Also, as you become the proud owner of things with a lower carbon footprint, you can now elect to spend less on things like green natural gas, electricity or carbon offsets. Try to go electric with small appliances (Lawn mower, trimmers, barbeque, and small snow blowers). In either Ontario or Quebec, this will have a much smaller carbon footprint than their fossil powered equivalents. Using your own power (Manual tools) is the lowest footprint. If your residence has A/C sign up for peak saver with your electricity supplier (Hydro Ottawa or Hydro One). Peak saver will direct your air conditioner to not run so hard during the peak of a heat wave. The benefit: during these periods of high electrical demand, any conservation directly curtails the use of fossil fuels to make power. Buy a thermostat with an I/P address. If you’re going away and don’t know how or if to adjust your home thermostat because you’re not sure when you’re coming back, an I/P address thermostat is a good idea. It allows you to log into your thermostat via the internet and adjust it remotely to get your home to the right temperature just before your return. Get a clothesline, wash with cold water. Eat less meat, especially beef. Try meatless Mondays. Growing corn to feed animals increases the greenhouse gases per calorie of food. Beef in particular generate a lot of methane gas – one of the key greenhouse gases. Have a food garden – try to replace imported foods. When buying food, go for food that’s locally produced as this reduces GHG’s emitted during shipping. Try the 150 km diet. Support organic farmers. Organic farms use fewer fossil fuels. Avoid using chemical fertilizers. All of the main ingredients of chemical fertilizers are either shipped long distances and therefore release GHG’s in shipping or are produced from fossils fuels (nitrogen fertilizer is generally produced by the Haber process, a process that uses natural gas). On land, the nitrogen portion of chemical fertilizers is particularly bad as during its use some of it will break down to oxides of nitrogen that are themselves potent greenhouse gasses. When traveling (air, bus or rail), always make a point of asking for carbon offsets for the journey you are doing (but make sure they are good offsets as outlined above). Avoid power consumption during peak periods when fossil fuels are providing each incremental amount of power provided. Speak up about climate change. Tell others that you believe that it’s serious and definitely man-made. Take your business to environmentally conscious places. Both Bullfrog Power and Green Power Action list companies that buy their green products. Conversely, some retailers have taking to listing the costs of their mandated recycling charges they pay as a form of protest – these might be places not to support. Conserve Water. This isn’t accounted for here, but it takes energy to get water to your home and take the waste water away, and treat it, afterwards. Water conservation equals energy conservation. Join ClimateFast. Take the pledge. Write your MP and the Prime Minister. Visit your MP and talk with him or her. Ask them to take the pledge. Write your newspaper about your concerns and the need for urgent policy changes and more conservation. Talk to your friends and family about this issue. Go to http://www.350.org and join the divestment campaign. Let go of any of the ways you personally make money on fossil fuels. In Summation: The good news! If you only do some of the first items recommended in this summary, a layout of $200 to $300 per year will eliminate over half your carbon emissions! And as a small bonus, you’ll be helping to push the entire economy away from fossil fuels. Add to that some actions that cost nothing and some purchase decisions that pay back over time and your carbon footprint will shrink to the size of chicken feet! or baby feet, or… the point is it’s not even that hard. Spread the word!